BlueWoW is a helper application that disables the filesystem redirection (\Windows\System32 -> \Windows\SysWow64) of 64-bit Windows, for some situations in target applications. Without BlueWoW, you cannot run 64-bit version of system tools (like cmd.exe, regedit.exe, notepad.exe, or calc.exe) directly from 32-bit launchers. Filesystem redirection of WOW64 forces the launcher to run the 32-bit version of the tools. BlueWoW resolves this annoying situation. 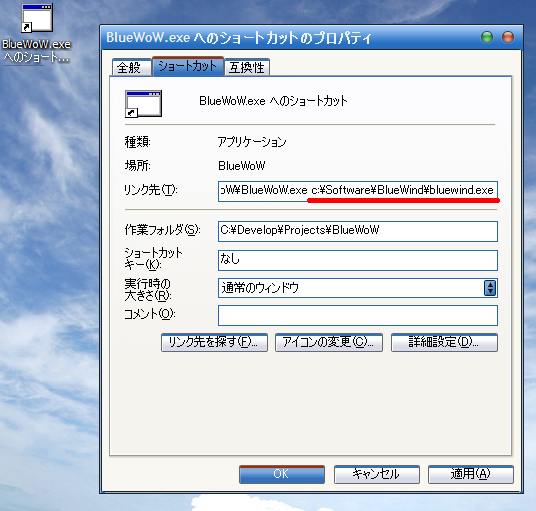 First, create a shortcut to BlueWoW.exe. Then open its property dialog. Then add the path to the target launcher to the end of the Link Target. Now you are able to run the launcher with the redirection disabled. Have fun!